Canon PowerShot SX710 HS and Canon Coolpix S9900 are two exceptional digital cameras that offer excellent performance and output quality. These two models are available at similar prices. Thus, as the effect, a lot of people often get confused in choosing between them. One thing for sure, each of the two models actually has each own strengths and advantages. 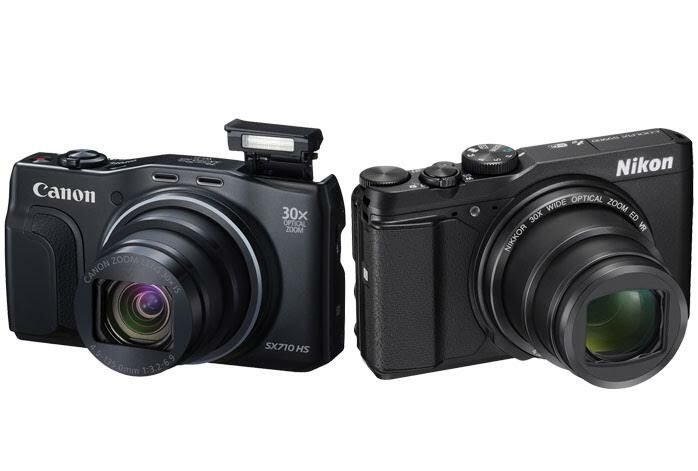 Below, we will see the comparisons between Canon PowerShot SX710 HS and Nikon Coolpix S9900 in order to determine which one will be the best for your needs and preferences. In terms of design, these two products are actually quite similar in one way and another. They are roughly of the same size. Canon PowerShot SX710 HS is 20g lighter than Nikon Coolpix S9900, but such difference is mostly insignificant. Both models are very compact and lightweight, allowing for easy storage and handling. Quite interestingly, they both happen to come with a similar type of lens, which is a 25-750mm lens that offers a maximum optical zoom of 30X. However, Canon PowerShot SX710 HS comes with F3.2 – F6.9 aperture while Nikon Coolpix S9900 comes with F3.7 – F6.4 aperture. Canon PowerShot SX710 HS seems to be very attractive due to its high native resolution. It is armed with a 20 MP CMOS sensor. It can capture high-res images and record videos in 1920 x 1080 Full HD maximum resolution. However, it only has an ISO range of 100 – 3,200 and a maximum shutter speed of 1/3,200s. On the other hand, Nikon Coolpix S9900 comes with a 16 MP CMOS sensor, yet it offers 6,400 maximum ISO and 1/4,000s maximum shutter speed. Hence, for control and adjustability, Nikon Coolpix S9900 is more reliable and versatile. Additionally, both models come with built-in Wi-Fi, but Nikon Coolpix S9900 has also been equipped with built-in GPS. Canon PowerShot SX710 HS is the way to go if you need to capture large-sized images, since the maximum resolution is higher. However, for versatility, you should go with Nikon Coolpix S9900.